You are a business owner, ready to do your business tax return. Can you do this return by yourself? What are the possible types of help you can get for preparing this business tax return? IMPORTANT: No matter who does your taxes, you as the business owner are ultimately responsible for your tax return, and you alone are answerable to the IRS if the return is fraudulent or inaccurate. When Can I Do My Own Business Taxes? You can always attempt to do your own business taxes or use business tax preparation software. Whether you can do your own business taxes depends on your business type and the complexity of your business. Business types range in complexity from a form on your personal tax return to a complete corporate income tax return. Freelancers or one-person small businesses (including one-person LLC's) can use Schedule C to file sole proprietor taxes and include that form with the person's tax return. Partnership, multiple-person LLC, and S corporation income tax returns are more complicated because there is a business tax return plus a statement (on Schedule K-1) showing each owner's share of the business profits or losses. Corporate tax returns are the most complicated of all because they include shareholder information and complicated schedules. This article on Tax Returns for Business Types might help you see the complexity of the return you will need to file. A simple Schedule C for a sole proprietor business is a lot different from a complex corporate or partnership tax return. The complexity of the return you need will dictate to a large degree the type of preparer you need. If Schedule C includes the manufacture or sale of products (requiring a cost of goods sold calculation), it gets more complicated, and there is more possibility of error. Preparing a tax return for a partnership or LLC is more difficult because it involves first the calculation of income or loss, then a distribution of that income or loss among the partners or LLC members. This gets trickier and increases the possibility of error. A corporate return (including a return for an S corporation) is the most difficult type of tax return, especially if there are shareholders and if the owners work in the business. As you can see from above, the most complex your tax return, the greater the advantage of having someone else prepare your business tax return. Consider the cost of a tax preparer vs. the cost of business tax software. Several of the business tax software programs come with online support from CPA's or Earned Agents, which can help with questions. But note that many of these people are not trained or experts in business taxes (as opposed to personal taxes). 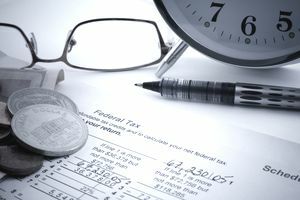 A tax preparer who is knowledgeable about business taxes might cost more, but they might be able to find loopholes that can save you more money. if you have a home business in a small space (under 300 square feet), you can use the simplified calculation for the home business space deduction. If you calculate cost of goods sold, it's possible to do the return yourself, using tax prep software. But in all other cases, getting the help of a business tax preparer is probably best. You wouldn't do your own wiring in the office, would you? Then let a tax pro help you with your business tax return. 1. Look at the tax form for your small business and decide what information you need and where you will get it. Most of the information will come from your business financial statements (balance sheet and income statement), but you may need information to complete sections on cost of goods sold and your home business space. 2. You can use business tax software to complete your business tax form. 3. If you are an owner of a sole proprietorship, partnership, or LLC, you are considered self-employed and you will have to calculate and pay self-employment tax (Social Security and Medicare tax), based on your business income. 4. Then add your business income and your self-employment tax calculation to your personal tax return. 1. Is this preparer knowledgeable about current tax law? A tax preparer must know the ins and outs of tax preparation for the current year, including changes to the tax laws. Gone are the days when a preparer had volumes of tax law updates to pour through, so, in the 21st century, this knowledge comes from excellent tax software - I mean for the professionals, not just the average person. 2. Can this preparer give you advice, not just prepare the tax filing documents? Again, anyone can prepare your taxes, but it's of more value to you as a business person to get tax advice on a continuing basis, throughout the year, and before tax time, to keep your taxes legitimately as low as possible. 3. Can this preparer represent you before the IRS? If you get that audit notice, can you call this person and discuss your return? Maybe, but the more important question is whether your preparer can go with you to a tax audit or go in your place. This is really where the "rubber meets the road," so to speak. Getting your taxes prepared is easy, but getting through an audit is a bigger deal entirely. Who can prepare business taxes? Enrolled preparers, who are registered with the IRS and who can sign tax returns and help with tax audits. Unenrolled preparers, who cannot sign tax returns or help with tax audits. An accountant who is not a CPA is considered an unenrolled preparer and this person cannot sign your tax return. If you want skilled help, and someone to sign your tax return, you must get a registered tax preparer, also called an enrolled preparer. Preparers who are paid to do tax returns and sign off on the returns must be registered with the IRS and get a Preparer Tax ID Number. Looking for an Enrolled/Registered Preparer? If you want someone to sign your tax return and help with audits, consider either an Enrolled Agent or a CPA. Enrolled agents have earned this designation through a rigorous test of tax law and are specifically employed to help with tax issues. CPA's are accountants who have passed a licensing exam in a state. CPA's can deal with accounting and payroll issues in addition to tax issues.